As much as I love my meat, I love seafood even more. I can have sushi every day and never get tired of the fresh fish. 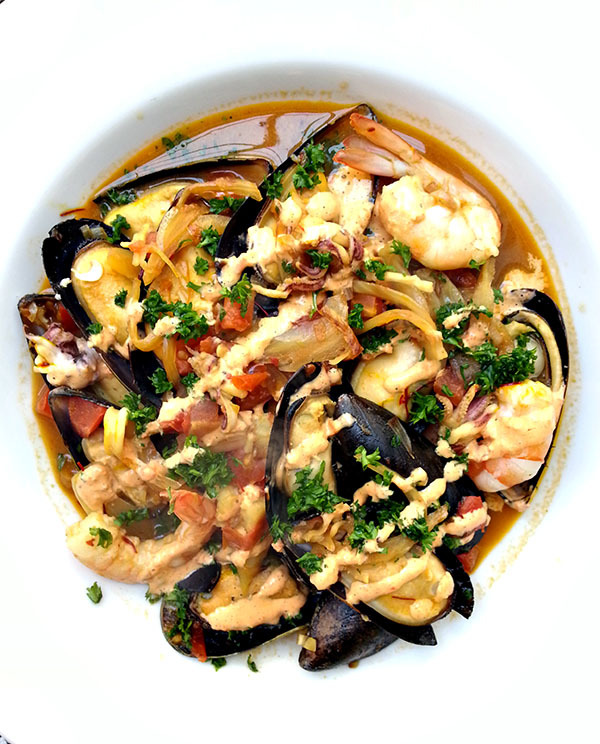 I’m always looking for new ways to prepare shellfish, especially since I know many are not fans of mussels or clams. 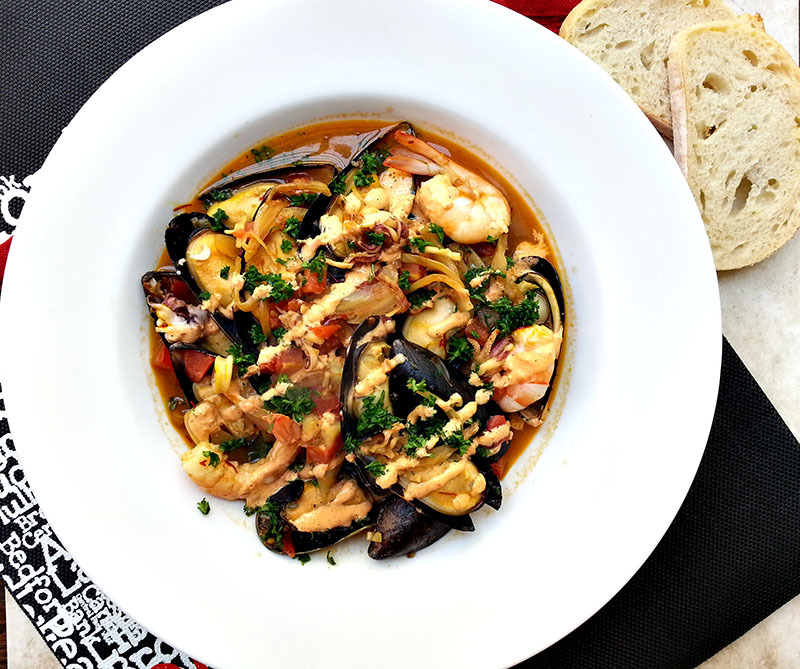 This dish is inspired by French cuisine, using a bouillabaisse-influenced stock to cook the seafood, and finishing the dish with rouille, a roasted red pepper sauce. 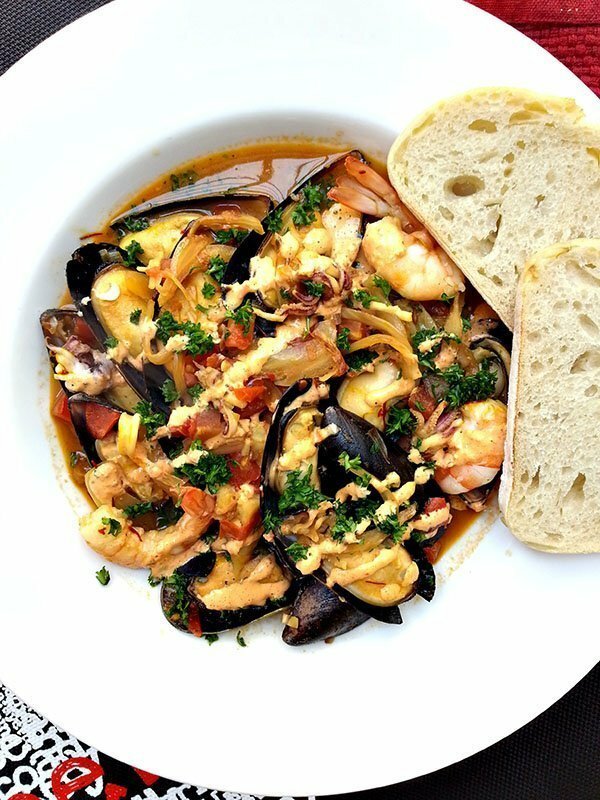 Mussels are usually a quick meal to prepare but take some time to prepare a flavorful stock and you’ll have an amazing seafood meal. Still not convinced to try mussels? 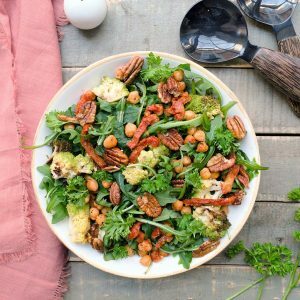 Try this recipe with just shrimp, clams or even fish! Prepare the broth. Remove heads and shell from shrimp, setting aside shrimp. Heat 2 tbsp oil in medium saucepot over medium-high heat. Add onions and celery and saute until softened and onions are translucent about 5 minutes. Add garlic and saute 30 seconds. 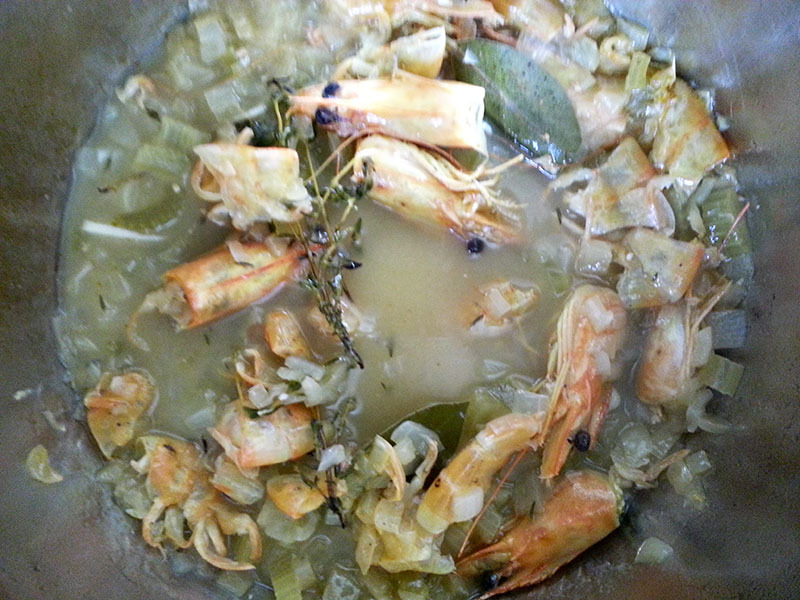 Add bay leaf, peppercorns, thyme, clam juice white wine, and reserved shrimp heads and shells, stirring to combine. Cover and bring to a boil. Reduce heat and simmer for 30 minutes. Remove from heat and strain broth. Add a pinch of saffron and set aside. Meanwhile, prepare the rouille. Combine roasted red pepper - juice of a lemon in a food processor or blender. Turn machine on and slowly drizzle olive oil into the mix, creating a thick sauce. Season with salt and pepper. Set aside. Heat wide pan or cast-iron pan over medium heat. Add 1 tbsp olive oil. When the oil is hot, add fennel and saute until softened, about 3-4 minutes. Add shallot and garlic and saute 30 more seconds. Add tomatoes and cook 1 minute. 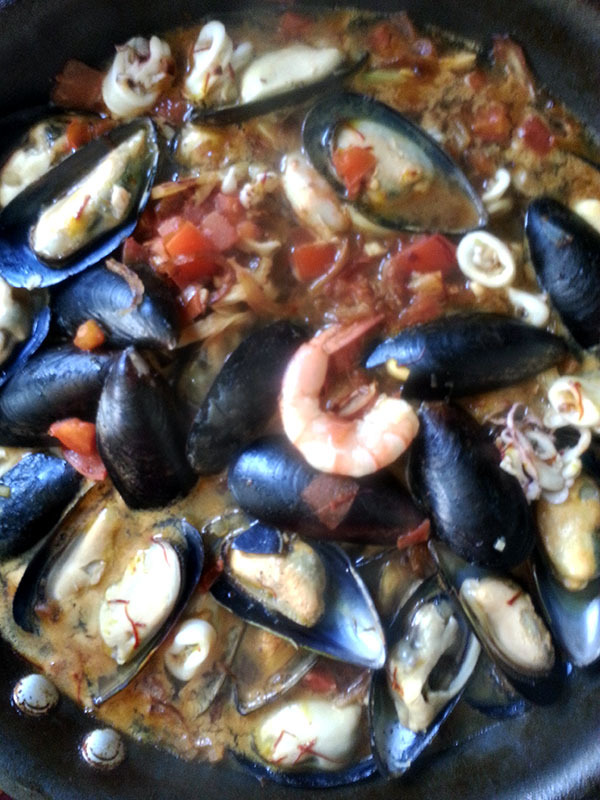 Add mussels, calamari and reserved shrimp to the pan. Pour prepared broth with saffron. Cover and bring the broth to a simmer. 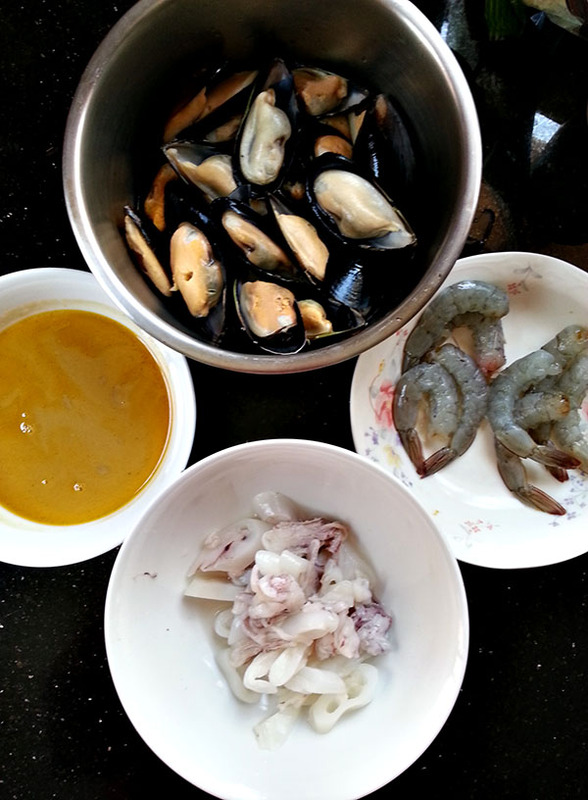 Cook seafood until mussel shells have opened and shrimp are lightly pink about 4-5 minutes. Remove cover, season with salt and pepper. Divide seafood into four plates, pouring broth on top. Drizzle rouille on top and sprinkle parsley. Serve. Although I’ve never been to Marseille, I know these mussels are not exactly the ones from the city; rather, they are Marseille-style mussels. Saffron, garlic, seafood, and wine are all found in the traditional Marseille mussels, I’ve just added some more ingredients. The first step is to make a lovely broth. This broth is the sauce for the finished dish so you want a flavorful stock. Unlike chicken and beef broth, seafood stocks typically take much less time since the ingredients don’t take as long to break down. You can use fish bones instead of shrimp heads and shells, but I thought this was a great way to utilize every part of the shrimp. Adding the saffron threads to the broth after it has been strained allows the spice to bloom. Blooming the saffron in hot water or broth brings out the full flavor of the spice and will shine more in the dish. Although saffron is expensive, a little goes a long way. For some reason, my market only carried mussels on the half-shell but sometimes you just have to work with what you got. If you can’t find fresh mussels, go for frozen. Every time I used frozen mussels, the seafood was still up to par. If calamari is difficult to find, purchase small squid instead. Slice squid into 1/2 inch rings and use in place for the calamari. Squid tends to be a bit tougher than calamari, but because it only cooks for a couple of minutes, they are still tender in this dish. Pardon the foggy picture, the steam was quickly rising from the pan. Remove the lid from the pan once the seafood is cooked and a strong aroma will evade your kitchen, in a good way! Pour all those lovely juices into the bowl with the seafood and finish with the rouille. 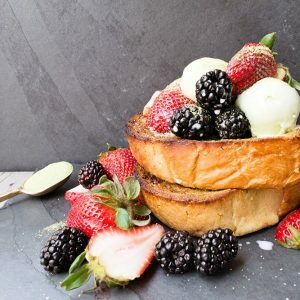 Serve with crusty bread to soak up the liquid and enjoy! The flavors of these Marseille mussels are bold but the overall dish is still light. The saffron shines through while the tender calamari, sweet shrimp and perfectly cooked mussels are complete the meal. Viva la France!